Order before 3:30pm weekdays and it ships same day! 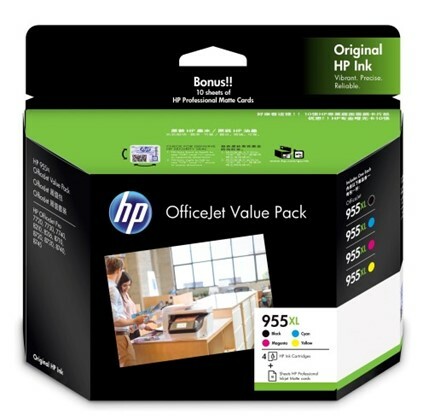 HP 955XL Office Value Pack consits of 10 4 x 6 Professional Inkjet Matte Cards For the above HP OfficeJet printers. Yield: Black approximately 2000 pages @5% coverage, Colours approximately 1600 pages @5% coverage each. In the Green panel above you can see if the goods are in stock and quickly it is likely to be shipped. We know when our customers order anything, they usually need it as fast as possible. That's why we assume you want the goods quickly and will deliver the goods to you as quickly as we possibly can. Therefore, we are committed to begin processing your order within one hour of receiving it (during business hours of course). This means on most occasions you will receive the goods within 24 - 36 working hours to most parts of the country provided the order has been received prior to 3.00 p.m. Note though in some cases an extra day is needed for delivery to the South Island and an extra 1-2 days is needed for Rural Delivery. We cannot ship on Public Holidays or Auckland Anniversary. We prefer to deliver to a physical address although we can deliver small items to P.O. Boxes if required. If there are any delays, we will contact you by email. Note: Bulky items will sometimes take longer than those times stated above. We will provide a full refund (excluding Delivery charges) for any product that is returned unopened and in original condition within 14 days for any reason whatsoever. For any returns after this time, please contact Computer Food. In most cases we are able to provide a credit although a restocking fee may apply.